Social media plays an important role when promoting your blog posts, driving traffic to your blog or even for paid advertisement. Twitter is one of the most popular social networking website. Twitter is used by millions of people, companies, celebrities, business etc. You can post your message (Tweet) to millions of followers easily with one click. No need to create a list of recipient to send SMS or email. It does not matter if you have few hundred followers or 10 million followers on Twitter, just post a tweet and every one will be notified. You can very easily connect with your followers and like minded people. FaceBook most popular social networking website released it’s official plug in for WordPress a long time ago. If you have a blog most probably you are using WordPress. WordPress is first choice of people, companies and brands when they plan to start a blog or website. If you are a WordPress user and blog regularly you might have installed a plug in to publish your blog post automatically on your social media pages and accounts. Most bloggers use unofficial plug ins and services to publish their latest blog posts on Social media (Twitter, facebook, GooglePlus etc) accounts. 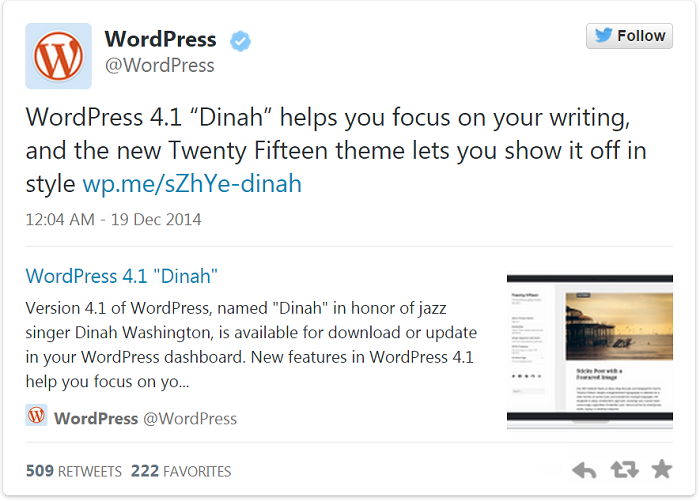 Now twitter has also released official Twitter WordPress plugin to post your blog post on your twitter account. With official Twitter plug in for WordPress it is much simpler and easy to post your content on twitter. You can read blog post The official Twitter plugin for WordPress is here on twitter developer blog to learn all the features of official Twitter plug in for WordPress. With this official official twitter wordpress plugin you can add Tweet, Follow button and Twitter cards very easily. You can also see Analytics and Advertising stats with this plugin. One of the best feature i like most is you can also add hashtags and custom text for tweets when creating post in WordPress dashboard. You can download official Twitter WordPress plugin from WordPress plugin directory. What to do Before installing official Twitter plugin for WordPress? Remember official twitter wordpress plugin requires WordPress version 3.9 or higher and your web server must be running PHP version 5.4+ otherwise this plug in won’t work. Twitter plugin adds a top-level menu item to your WordPress admin menu sidebar. If your server supports PHP 5.4+ the plugin setting link will appear below the Settings menu item on sidebar menu listing. If you can not see any twitter link in your sidebar menu after installing and activating this plug in, check PHP version. You can contact your web hosting provider for more details. If your Hosting provider does not supports PHP 5.4+ You can also install and test official Twitter plugin WordPress on local server. You need a local WordPress installation. There are many ways to install WordPress locally on Windows, MAC or Linux. I have tested official Twitter plugin for WordPress on my local WordPress installation and it worked fine. I have installed WordPress with WAMP server on Windows. You can install WordPress locally with WAMP, XAMPP or MAMP Server. WAMP is for Windows users only, MAMP for MAC while XAMPP server is available for Windows, MAC and Linux users. Bitnami WordPress installer is easiest way to install WordPress locally on your PC or MAC. I think twitter has made a good decision and WordPress users will use this plug in. What do you think, will you use official Twitter WordPress plugin or not. Share your thoughts in comments.